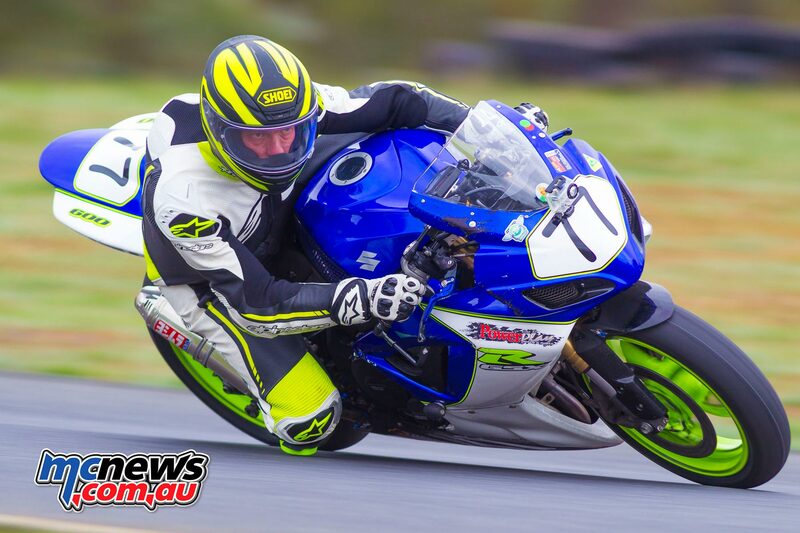 After round one in March provided near perfect weather conditions for riders and officials, round two if the Vic Wreckers Victorian Interclub Road Racing Series, again at Broadford, delivered the complete opposite. While racing in wet weather is always difficult, as witnessed at the previous Hartwell round at Broadford, the Interclub series was blessed with even more atrocious conditions. It was cold. Freezing cold. With daytime temperatures not improving much past 5-degrees for most of the day, and it being as low as 1-degree when bikes were on track. Even by lunchtime the thermometer was only showing a brass monkeyish 2.7-degrees. 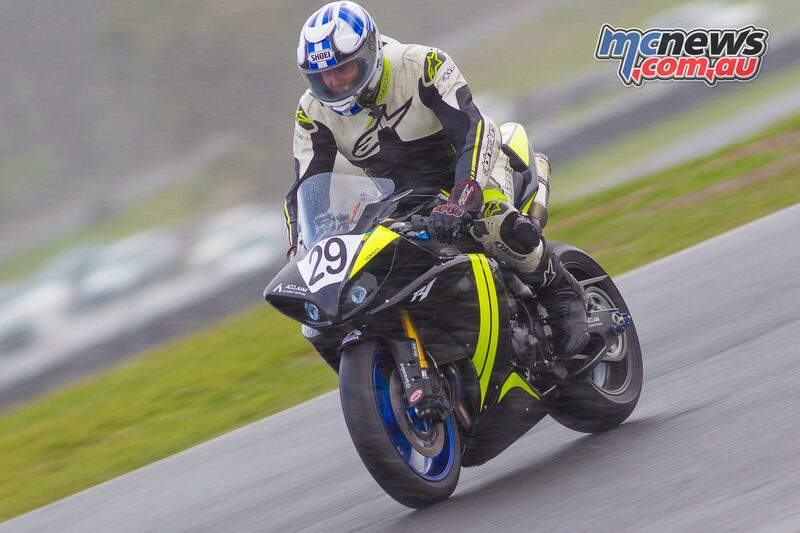 But it wasn’t just the cold which added to the challenges of racing a 200hp motorcycle around Broadford’s challenging layout. It rained heavily. Then it didn’t. Then it rained again. Then the wind blew and the track dried out. But only long enough for people to change tyres and then it rained again. Every race was a a conundrum of what tyres to run and every race had conditions change within the six or eight laps of the race. For the first time in my life, I was glad to be a spectator and not behind the handlebars of a racebike. Some riders were lucky enough to have spare wheels with their wet or dry tyres ready on standby, others looked to Mark Lamont to be doing tyre changes at the last minute on their only set of wheels. Others just sucked it up and ran what they brang! Some choosing to brave the wet on slicks, or DOT approved grooved road rubber. Others choosing to try and make a wet tyre last six laps in dry conditions. If all this wasn’t enough of a challenge for the riders, the wind added yet another dimension to the difficulty of racing a motorcycle. But the wind was just like the sun and the rain. Inconsistent. Several races started without a breath of wind and by halfway through the first lap gusts were blowing riders across the track. Half a lap later, the wind disappeared leaving riders always wondering when they were going to be pushed off line. Given the conditions, carnage would have been an expected outcome. While there were several crashes, there was not the number of tumbles that one might have expected. 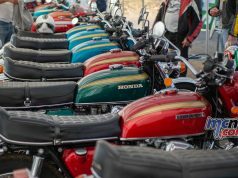 Credit to all those who rode and managed to bring the bike home in the trying weather. There were some rather notable crashes though, which, thankfully, caused no serious injury. With only one rider sustaining a collarbone injury over the two days of practice and racing. However, two riders provided some freakish crashes which added to the interest of the day. As mentioned, neither of these two rider were seriously injured, so I say this not in a ghoulish way, as no one wants to see riders crash. But both crashes were none the less spectacular. The first was newcomer and English Ex-Pat Karl Grouwstra. 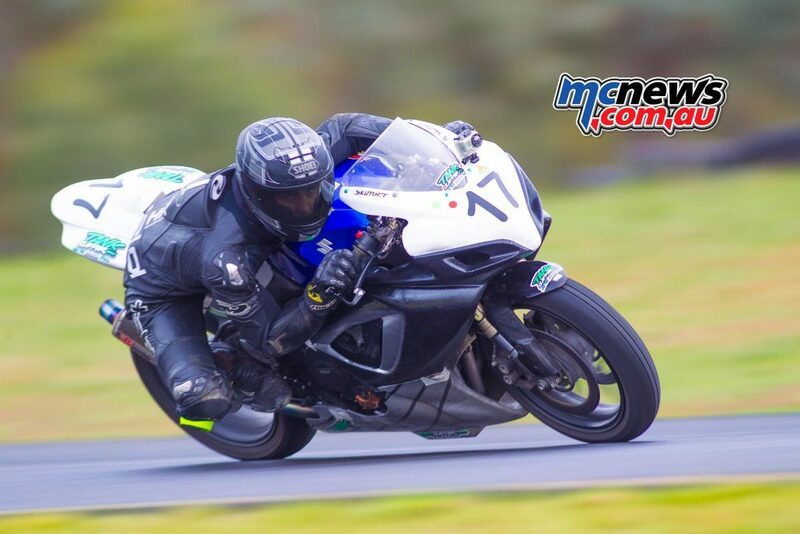 Karl is a mountain of a man and muscles his 1000cc Kawasaki Superbike around Broadford at a much faster pace than his Novice status suggests. At the previous Hartwell round, he only missed out on a clean sweep and the round win with a silly crash in one race. He’s proper fast, even against the A and B graders. He’s also superb in the wet. However Karl had an absolute Barry Crocker of a meeting and gave the start line marshals some additional work to do at the start of the Novice race. The novice field gridded up as per normal, with Karl the pole sitter. It was all looking great for Karl to get a great start and disappear into the distance. However, his Kawasaki ZX-10R had other ideas. 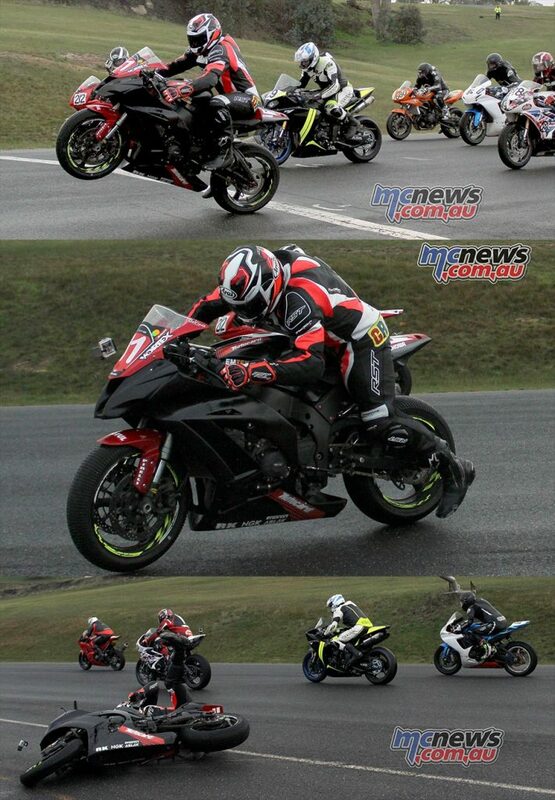 The lights went out and Karl’s ZX-10R Launched……..and I truly mean launched. 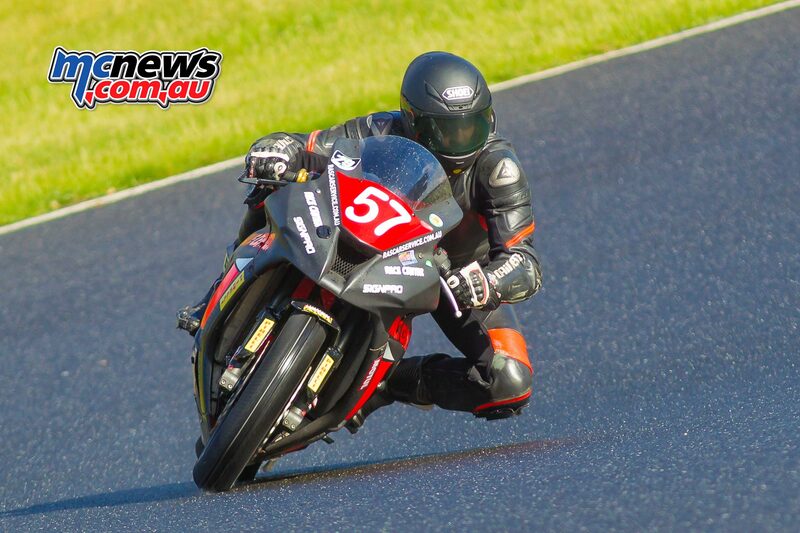 The front wheel lofted vertically and Karl was unceremoniously dumped off the back, as the bike lurched sideways and belly flopped onto the side of the track. Thankfully the bike fell to the side of the track and as Karl was the pole-pole-sitter, the bike fell out of the way of all the riders behind him on the grid, causing barely a raised heartbeat for them. To his credit, Karl’s only thoughts were to get going again and with the assistance of the marshals and a quick check of the controls he was off like a cut cat chasing down the field. The red mist had descended over the visor and you could see Karl fully intended to catch the entire field and pass them. Two laps later he was nearly there and had made his way up to 4th with the riders in front well within reach of him with the remaining 3 laps to run. However, Karl pushed a little too hard and as he braked into the pit hairpin on lap three you could clearly see from the side of the track that this was going to end in tears. He left his braking point a little late. Had it been dry I would have commented on how late he braked. But it was pouring with rain and the track was fully wet. Even with good wet tyres on it was obvious that he was not going to make it. He made a valiant and brave attempt to pull it up, but had to trail brake a little longer than physics would maintain grip and down he went. 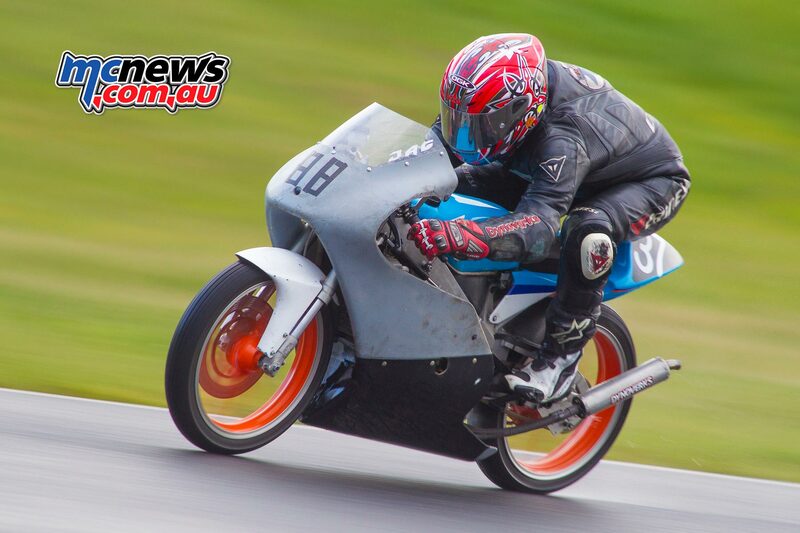 Once he hit the wet and soggy infield, both he and the bike accelerated on their side. All breathed a sigh of relief when the big unit quickly got to his feet and gave his right thigh a good fist pump for making the error. At this point we all knew he was OK. Karl exited through the pit-road entrance and the bike lay forlornly in the wet infield awaiting the recovery vehicle to come and collect it. The day didn’t get better for Karl after this though. He and his crew worked furiously to repair the bike for the next race. Which they managed to do. However, even though the controls all tested ok in the pits, the throttle went south into turn one on the first lap of the very next race and Karl went down again with a wide open stuck throttle. 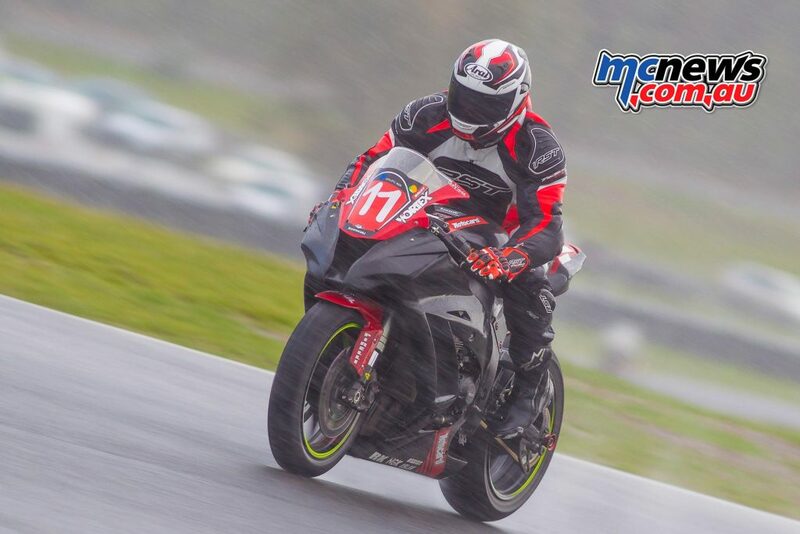 Not the nicest way to try and ride a 200hp superbike in wet conditions. 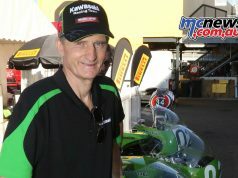 Karl wisely called it a day after this and the bike was put on the trailer to be taken home and repaired for the next outing at Phillip Island. We wish Karl far better luck on his next outing. He’s sure as hell got some talent and with some further racing experience I can see the big bloke (He’s over 6′ tall and built like a Mack truck), really doing well in the superbike class. Travis De Bono was yet another to provide an eye popping, heart in mouth moment during his race. Travis is a renowned elbow dragger in dry conditions and wasn’t far off doing the same in the pouring rain. He was leading his race and absolutely flying with Adrian Forde just behind keeping him honest and actually catching him at some points on the track, particularly the left hander leading onto the main straight. 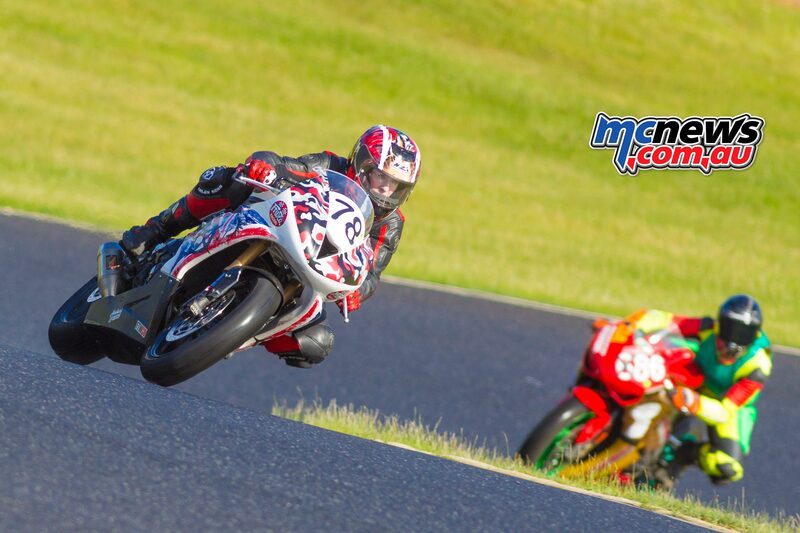 I’m not sure if Travis could hear the bike behind him, but he sure as hell opened the taps way too early as he exited the left hander and headed down the off camber exit onto the main straight. The rear wet snapped out of line instantly. The bike then flicked Travis over the high side in a ground control to Major Tom moment and the bike then proceeded to tumble over and over, with a few twists, turns and backflips thrown in to ensure a full 10-degree of difficulty for the manoeuvre. Travis must have been airborne for at least 20-metres and as high as five metres. I watched it happen from the pit wall and could only hope that he landed well. It sure knocked the stuffing out of him, but he managed to scramble to his knees and hobble off the middle of the track to avoid all the following riders, and then had a little lay down in the grass at the entrance to the track. He was soon enough to his feet, albeit with a heavy limp. The bike didn’t fare so well, with the Suzuki GSX-R600 splitting both it’s frame rails between the two welds midway along the beams. As the bike was sitting in the middle of the track, the race was red flagged and restarted once the bike and rider were cleared from the track. Pleasingly, Travis only had a short ride in the ambulance back to the pits and was shortly afterwards walking around and assessing the damage to his mangled bike. It sure was a mess as the photos will attest. There were a few other incidents during the day, but nothing matched the efforts of Travis and Karl. 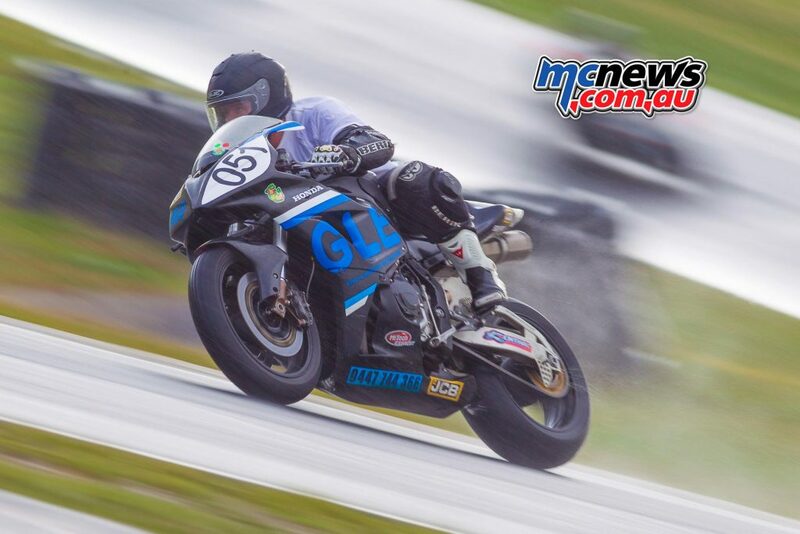 The rain threw up a few surprises from what is the normal rankings of the riders apart from the always consistent Dean Archbold on his ZX-10R and Steve Rubinic. 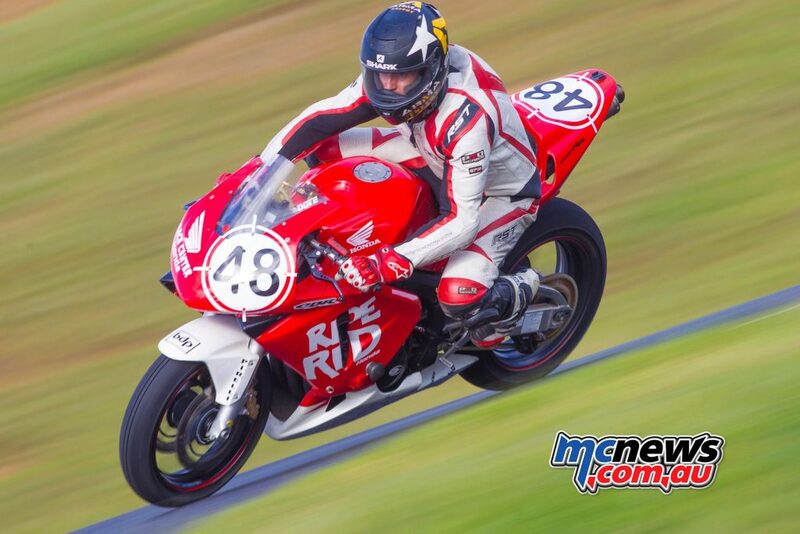 Richard Cannatelli improved significantly taking third overall for the weekend. Obviously having the assistance of the Race Center crew with his crew chief being none other than Jed Metcher and his father too, making it team Cannatelli/Metcher. Travis Baas rode well, but was not riding as well as has been seen at previous outings, perhaps his webbed feet had been left at home. Steven Tozer only rode race one, which he of course won. But chose not to go out as the track got wetter and wetter. I don’t blame him, after all his years of winning club and state championships, he has nothing to prove to anyone. Richard Hewson did exceptionally well in his first ever road race on his 2012 Yamaha R1. His bike looked fantastic and would have to be up there with best presented honours. It just needs some sponsorship decals to make it complete. Trent Binaisse and Michael McGuire hitched up there frilly skirts and had a red hot go too. With a little more practice and perhaps lowering the length of their stiletto heels on their race boots, I can see both these guys starting to mix it with some of the female riders in some meetings next year. 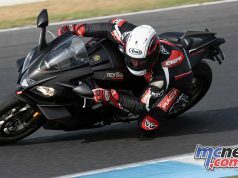 Being and ex 600 rider, I always enjoy the supersport bikes. Craig Doye had a great weekend proving there is life in the old dog yet and there is not much that can replace experience. At times he had me on the edge of my seat with the lean angles he achieved in the wet. Young Jack Gallagher had a brilliant weekend. 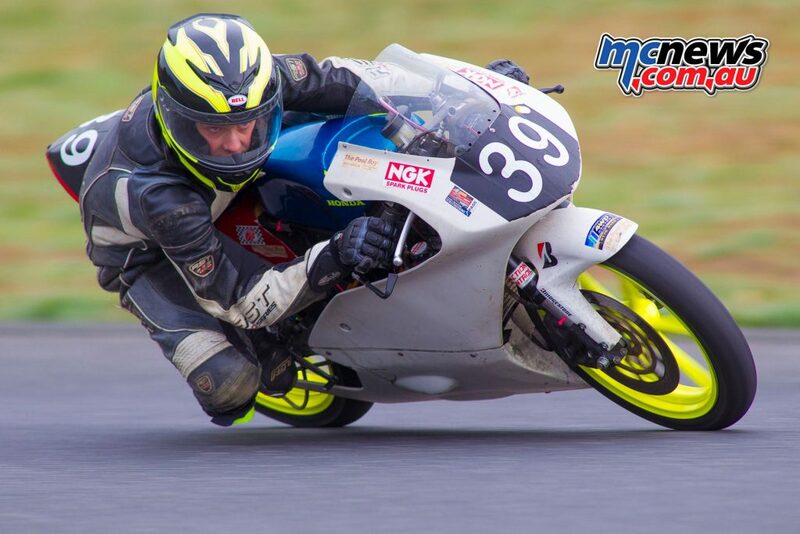 Jack had a big crash at Broadford last year on his 300 proddie and has been steadily improving since his transition to the 600 class. He has support from JLT and, of course, dad’s cheque book, who has foregone some of his racing endeavours in order to support young Jack. Jack has some lofty goals and we wish him well in achieving them. 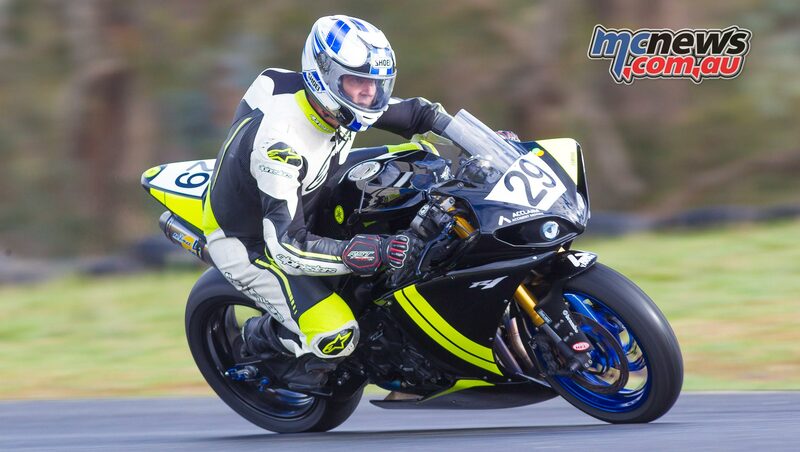 He certainly is approaching things in the right manner, chipping away at his lap-times and gaining valuable experience with every practice and race day. He even managed a win in race one which certainly put a smile on his face. 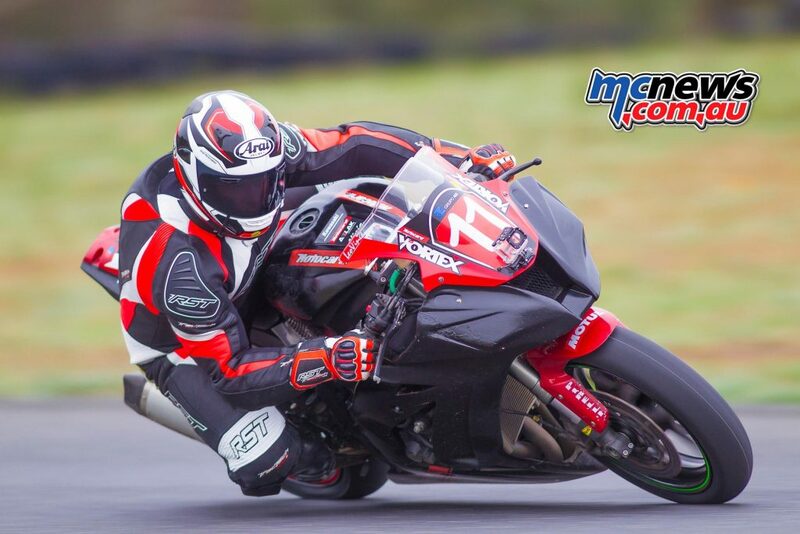 Michael Conway also continues to ride exceptionally well. 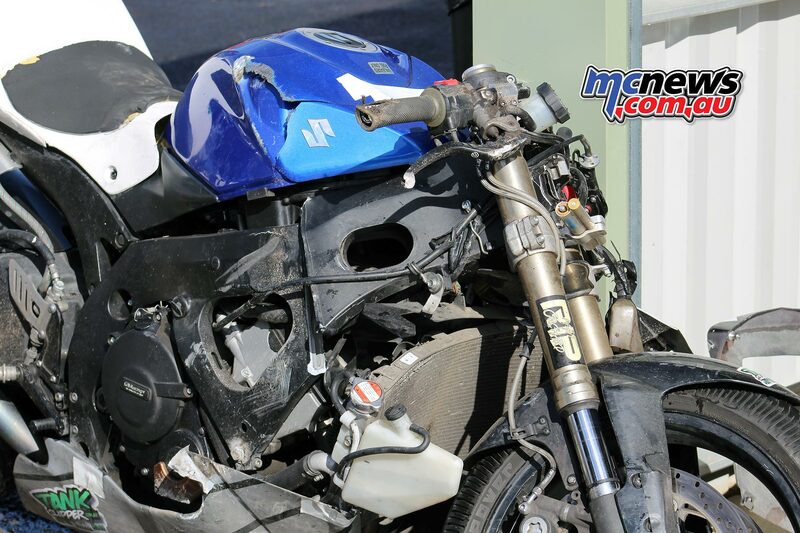 He did have a rather nasty highside at crash corner in the club race, which had him and his crew chief Martin Royle hurriedly repairing the bike before the second race. Riding a ten-year-old bike against the moderns, he is doing exceptionally well. Already mentioned above in detail, Karl Grouwstra blew his pole position advantage when his launch control let him down and literally spat him off the back of the bike at the start line. 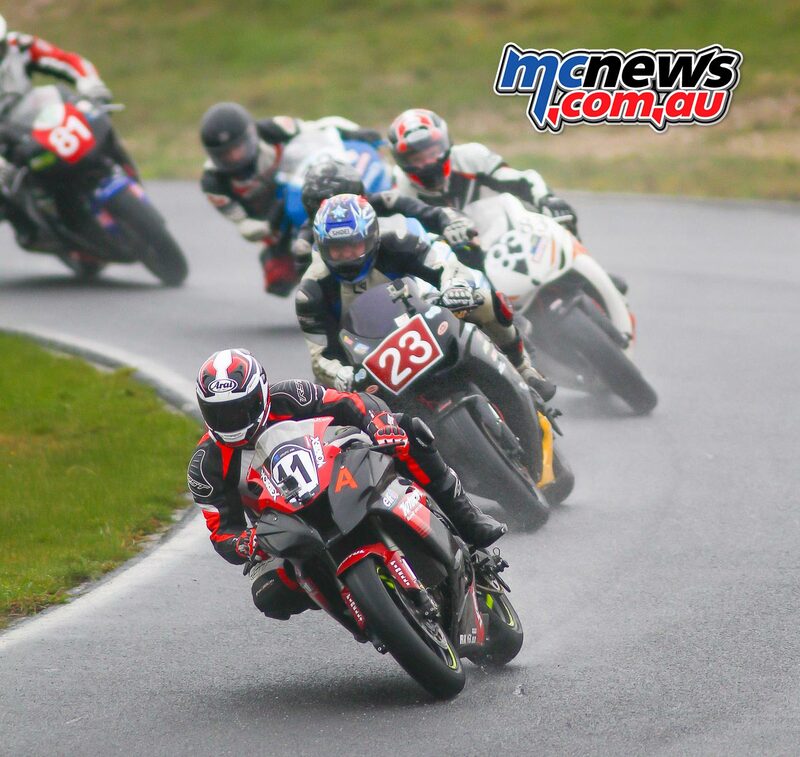 Young Chelsea Subala was brave and stuck it out in the atrocious conditions to complete her first ever road race meeting without crashing, which is better than a lot of the more experienced riders can claim. 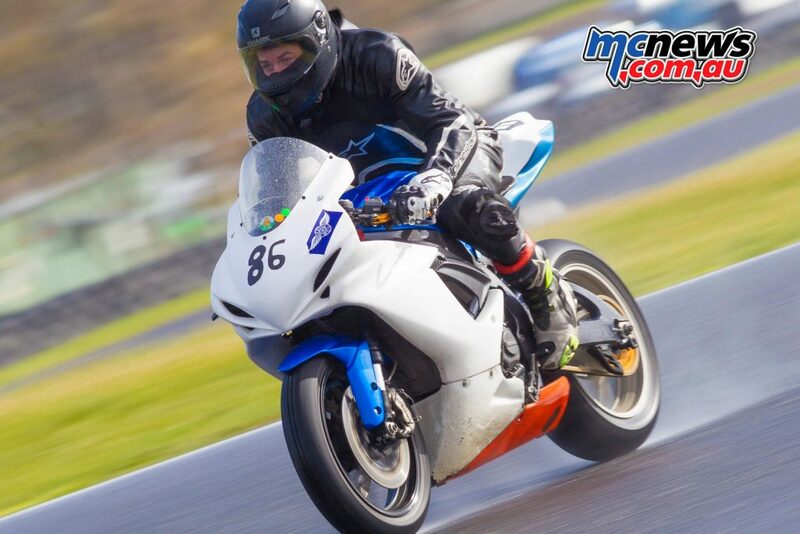 Richard Hewson on his immaculate R1 battled through his first ever road race meeting without wet tyres and to his credit managed to keep the thing upright all weekend. It must have been tempting to wick it up as he watched those with wet tyres disappear in front. 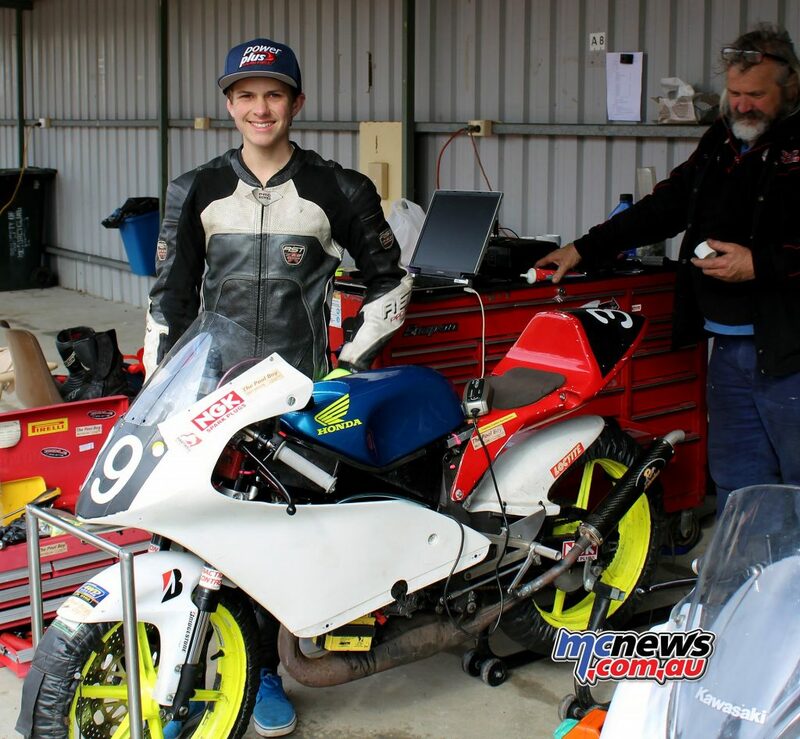 I look forward to seeing Richard at Phillip Island, a track he knows very well and a track where he has put down a lot of laps and can cut a fast time on. He will be one to watch for sure in his next meeting. Simone Winks Triumph Daytona looked amazing and Simone rode brilliantly all weekend in the crappy conditions to take second place. Adrian Forde was left to take the spoils of victory after Karl Grouwstra’s bike exited stage left on the start line. 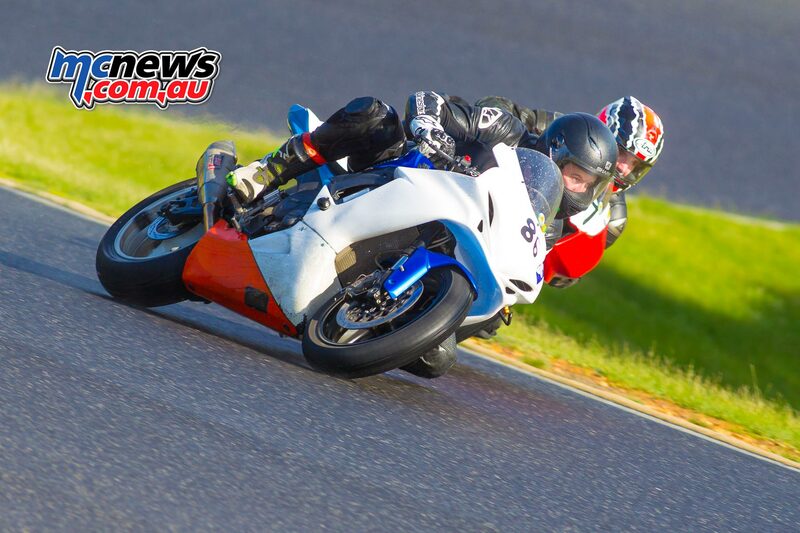 Junior Scott Nicholson finally got the better of the very experienced Peter Scott for the entire weekend. Scott has been steadily getting faster and faster and at the last meeting managed to get a win over Peter. This weekend belonged to Scott though in the wet conditions with him taking both wins. Of note was seeing Dean Oughtred, former Superbike racer out in the 125 class, proving he can ride anything with two wheels. I still recall fondly chasing Dean in 2005 on his R1 with my old ’95 ZX-6R and watching him pull away with every lap. One fast guy and age has not wearied him. I’ll be watching eagerly to see the next generation of Oughtred’s out on the road race track, with his son recently attending the supermoto development day and looking like another talent for the future.